Tzompantli at Chichen Itza is located in Yuctan, Mexico and is known as The Wall of Skulls. Tzompantli is an ancient Mayan ruin that is a Toltec structure. The word “tzompantli” literally means rack of skulls. This structure was actually used to publicly display the skulls of sacrificial victims or captives of war. 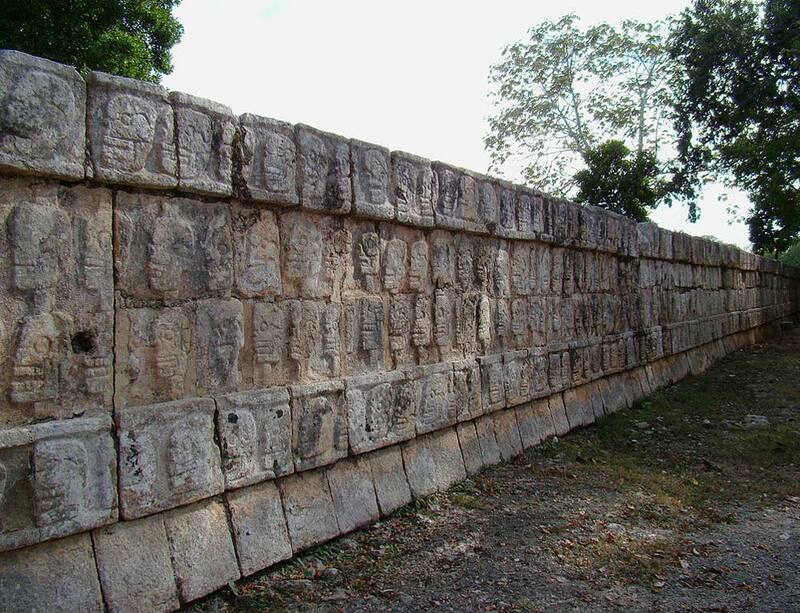 The platform walls of this beautiful structure have very interesting carvings that were made by Toltecs. The Toltecs were known to have introduced human sacrifices to the Itzas when they conquered the land centuries before the Spanish arrived. There are four themes depicted on the platform. First, there is a scene of the skull rack. Then there is a depiction of eagles feasting on human hearts. Next, there are images of skeleton warriors dancing. Finally, a ceremony involving human sacrifice is displayed. The ritual that was involved in displaying decapitated heads was part of a game. This was discovered in later studies after extensive research on different texts of Mesoamerican hieroglyphics. The ancient ball court game was popular in the region and was celebrated by the civilization. It was first assumed that the losers’ heads were displayed on the platform. However, it was found that it was actually the heads of the winner that were decapitated and displayed. This form of human sacrifice was seen as a high honor in their ancient society. Although, not all games resulted in this outcome. The Tzompantli at Chichen Itza is known as one of the most preserved platforms. The inscriptions found on the structure are well intact. The low, flat platform in the Chichen Itza area was the first wall of skulls that the horrified Spanish conquistadors had come across.